In 1959 the Swiss company Pilatus Aircraft built a single-engined light utility aircraft, the PC-6 Porter, with a Lycoming GSO-480 340 h.p. engine. The aircraft was built in relatively small quantities (72 units), but its construction, despite its basic nature, had great potential for a variety of tasks. 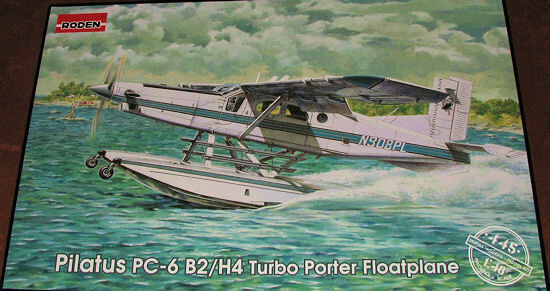 Two years later there appeared the PC-6A Turbo Porter with a 520 h.p. Turbomeca Astazou engine which was better than its predecessor in all major performance indicators. Later, another engine was installed in the aircraft - the 550 hp Pratt & Whitney Canada PT6A. Now there were individual pilot doors on both sides of the fuselage in the PC-6B version, in addition to sliding side doors, which facilitated departure from the airport or evacuation of the cockpit in the air in case of emergency. As in the PC-6A, the nose displayed a characteristic straight and elongated shape. In the modified PC-6/B2-H2 a 680 horsepower engine was installed, which greatly improved the aircraft's capabilities. The PC-6 turboprop became popular among pilots very quickly, and it began to sell well in Switzerland and was exported to many other countries. For a long period of time it was used by the Air Forces of many countries on different continents - from European Austria to distant Australia. But even the longest-living and most successful aircraft designs eventually end their service lives, and it is no wonder that in the mid 1990's the PC-6 was finally taken out of military service everywhere. Even after working hard for so long in Air Force service, these airplanes had a chance for a second life. So it was with the PC-6 - a large number of private enthusiasts from different corners of the world dreamed of acquiring this airplane with excellent performance and capability for civil use. During the military service of the PC-6 there were some attempts to convert it from wheeled to floatplane configuration, allowing it to land on water surfaces. However, this adaptation had no appeal for the military in any of the countries where the PC-6 was used. Nevertheless, some civil PC-6's were fitted with floats and continued to be used in regions with extensive areas of lakes and rivers at the beginning of the Twenty-First Century. Here is another boxing of this particular kit and includes an additional sprue to take care of the variant being kitted. Otherwis e the plastic is pretty much the same. 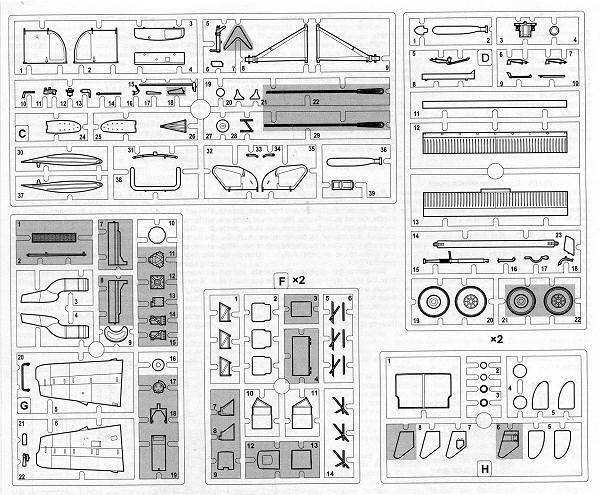 I've provided a scan of the new sprue that contains the floats and additional airframe bits to make the floatplane version in addition to the overall sprues image as was shown in a previous preview. Molded in grey plastic, the detailing on this one is very much up to Roden's standards and the molds have held up quite well over the various boxings. . Two of them are duplicated (the one with the seats and the one with the wheels, which are not required for this boxing) and one is clear. I found no real problem with flash, though there are a couple of sink areas on the parts that are really thick. Anything of any size had ejector pin marks or towers on one side. This means that a few parts (like the doors) will need some additional attention. The cockpit and cabin areas are nicely detailed with the cockpit being well appointed with seats that are different from previous boxings, control sticks, rudder pedals and so on. The cabin has a number of the more open seats that are similar to previous kits. This particular version does not have a sliding door on both sides, so on the left there are two hinged doors that open outwards from the center. These parts were on the previous kit but not to be used. There are separate elevators, ailerons and flaps. However, these are to be constructed in the neutral position otherwise the various actuating rods won't fit. There is a larger fin fillet that simply fits over the one molded on the fuselage halves. Of course, the engine assembly is separate to the rest of the airframe and is to be attached near the end of construction. The floats and their braces are a separate assembly that is done at the final step. These are such that the kit is designed to be modeled with the wheels extended. I would recommend some weight in the front of the floats in case tail sitting might be an issue. There is no information on modeling the wheels retracted and water rudders lowered, but I would think that this should not be that difficult in case you wished to do a water-borne diorama. Instructions are well done with color references in FS 595, Testors Acrylic and Testors Model Master references. The instructions also have two diagrams to show where to drill various holes for the antennas and such. None of these holes are started so the measurements are quite exact as to placement. When I built the AU-23, I copied the diagram to size and placed it on the fuselage top, drilling through the areas marked. It worked very well. 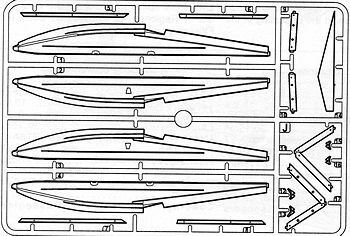 Markings are provided for a single aircraft as shown on the box art. This aircraft belongs to the San Jose Sharks team in Costa Rica, though it has US registration. The decals are quite glossy and well printed with no registration errors. I noticed that the surface of the sheet is a bit sticky for some reason. Perhaps this means a change in the way the decals are printed.